The angular momentum is a conserved quantity and the usual theoretical interpretation of the origin of the angular momentum of galaxies is that this is originated by from tidal interactions of the galaxy with its neighborhoods. We propose in this paper (in print in Astronomy and Astrophysics) a new mechanism for its origin based that can be efficient also for the case of an isolated object (or for an object with small tidal interactions). The new mechanism works as follows : during the violent relaxation of an isolated self-gravitating system a significant fraction of its mass may be ejected. If the time varying gravitational field also breaks spherical symmetry this mass can potentially carry angular momentum. Thus starting initial configurations with zero angular momentum can in principle lead to a bound virialized system with non-zero angular momentum even though the overall angular momentum is conserved. 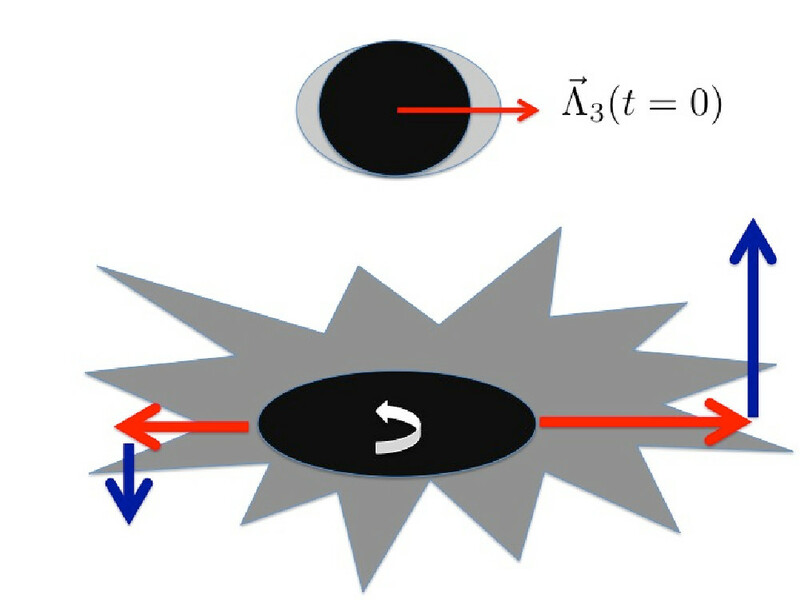 A simple picture of this mechanism is illustrated in the following figure. The astrophysical and cosmological implications of such a fundamental physical process will be subject of a forthcoming work.